Actionwork® can visit your school with the amazing Anti Bullying Week Roadshow or if you prefer we can run some Anti-Bullying Workshops for you or even a Peer Support training programme or special anti-bullying film making project. Please ring 01934 815163 to discuss. Our award-winning National Anti-Bullying Roadshow will compliment the 2018 theme for anti-bullying week. The roadshows are powerful, fun, engaging, educational and empowering. Shows, workshops and assemblies available. 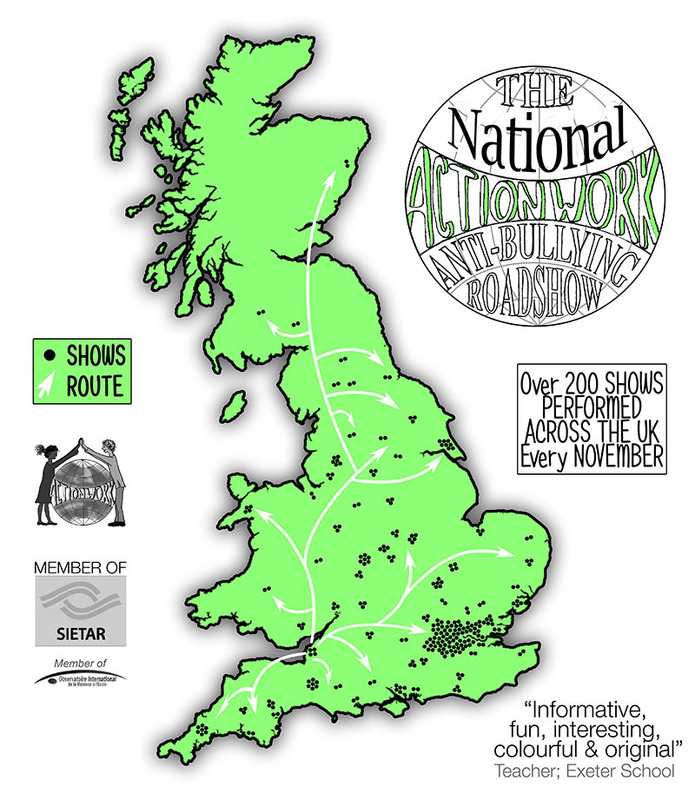 The 2018 Anti-Bullying Roadshow is now touring the UK from the 5th-30th November 2018. The roadshow also incorporates Anti Bullying Month 2018. "We were amazed", "Our students were entertained throughout", "We want more", just some of the quotes from schools who have booked our Anti Bullying Week Roadshow. The Roadshow is powerful, fun and exciting and includes; music, science, strategies and the most up-to-date research and information on bullying possible. In the roadshow we explore the bully behind bullying and the victim inside us all in one amazing extravaganza. The ultimate anti-bullying week theatre in education production for primary schools, secondary schools and colleges. Read all about how we work and operate in schools via an independent evaulation of Actionwork® from Plymouth University. The Anti-Bullying Roadshow is a high impact production that is positive, fun and engaging. It is suitable for main stream and special schools. The Anti-Bullying Roadshow provides an important focus for schools' anti-bullying campaigns and provides that 'WOW' factor to students and teachers alike, complimenting existing anti-bullying work in schools, colleges and community centres. The Roadshow allows schools and other groups to make a strong statement of non-tolerance towards bullying, whilst giving their students and young people the chance to explore the issues and the importance of their own role in dealing with it. The Roadshow's dual goal is awareness-raising and empowerment. The Actionwork® Anti Bullying Roadshow has won numerous awards including the 'Flame Award', 'Empowerment Kansai Award' and the 'ipoweri Award' for best practice. The roadshows have been commended by numerous leading anti-bullying researchers and practitioners including those at Plymouth University, Goldsmiths College and Hua Dan. Actionwork® are core members of the Anti Bullying Alliance (ABA), the International Observatory of Violence in Schools (IOVS) and the Society for Intercultural Education, Training and Research (SIETAR). We can help make your anti-bullying day special, memorable, educational, creative and fun. We can visit you for half-a-day, a full-day or even longer depending upon your needs. What do you get as part of our 1-day Anti Bullying Roadshow package? 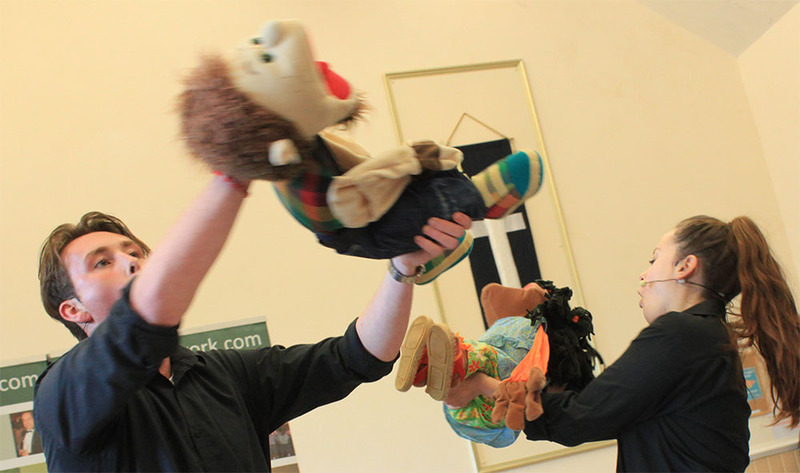 * Puppet shows for reception to year 2, lower primary for years 3 and 4, and upper primary for years 5 and 6. * Roadshows for year 7 to year 11. To make a booking or for further information please see our Anti-Bullying Roadshow Booking Page. Every year Actionwork® produces the national and international Anti-Bullying Roadshow. This tours to schools, youth clubs, colleges, universities and parent groups all over the UK and abroad. 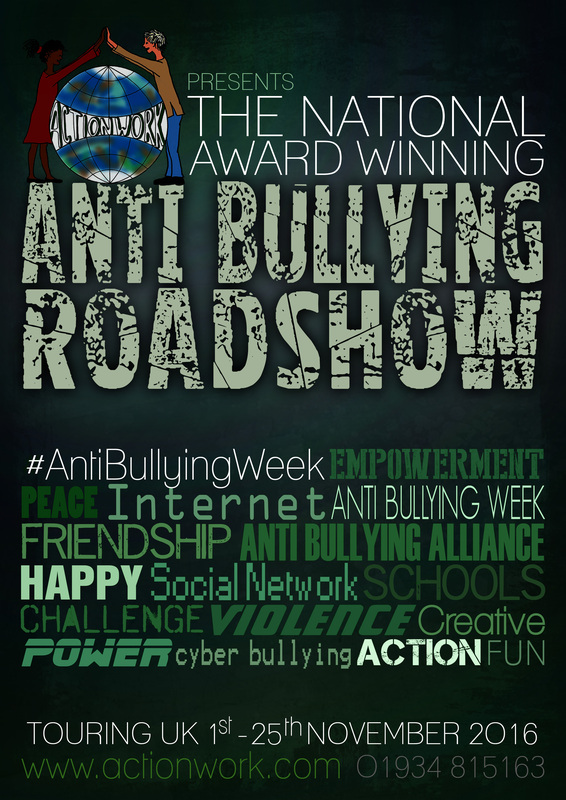 Each year we link the theme of the roadshow with the theme for Anti-Bullying Week. Previous roadshows have included: All Different All Equal, Power For Good, Cyber Tears, Let's Stop Bullying For All, Make a Noise About Bullying, The Science of Bullying, Chronicle of a Bully, Cyber Scream, Clash, and Silent Scream. 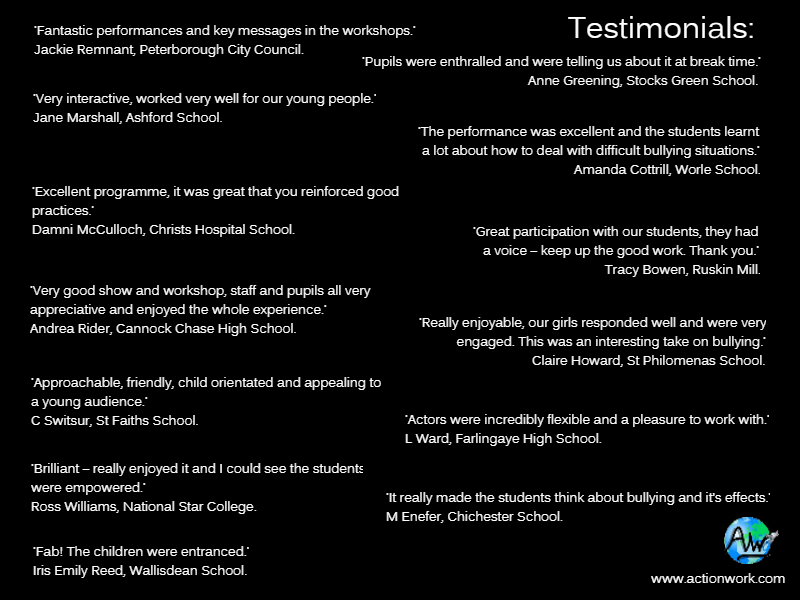 Our anti-bullying roadshows have been called the ultimate theatre-in-education experience. The Roadshows last for 60-minutes and can be performed to a whole year group at a time. The Roadshow can be complemented by additional creative interactive workshops - please ask for details. The 2018 roadshow really is a special event. A packed spectacle showcasing a variety of strategies in dealing with bullying and highlighting ways to empowerment. The Anti-Bullying Roadshow is a multi-part package made up of films, presentations, quizzes, interactive workshop elements, prizes, sound and some dedicated anti-bullying resources. - Roadshows can be mixed. For example; a primary school can have a puppet show for reception to year 2's, a lower primary show for years 3-4 and an upper primary roadshow for years 5 and 6's if they want - all in one day. Please contact us or go direct to our booking page. Please note that we have been succesfully touring workshops, shows and roadshows throughout the UK and abroad for many years now. In the UK we have toured to London and the south-east, Bristol, Devon and the south-west, Birmingham, Coventry, Nottingham and the midlands, Manchester, Liverpool, Leeds, York, Warrington and many other parts of the North, Glasgow and Scotland, Cardiff, Swansea and Wales, Isle of man, Weston-super-Mare, North Somerset, and all over the UK. 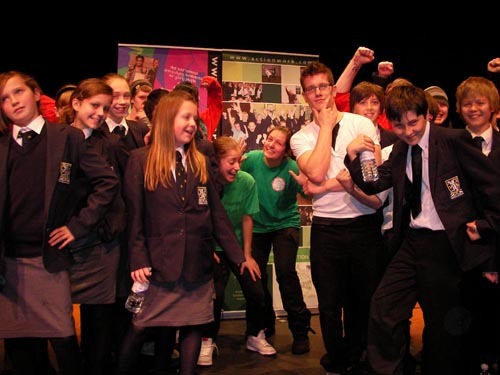 We have been succesfully touring the anti-bullying roadshow throughout the UK and abroad for over 25-years. In the UK we have toured to London and the south-east, Bristol, Devon and the south-west, Birmingham, Coventry, Nottingham and the midlands, Manchester, Liverpool, Leeds, York, Warrington and many other parts of the North. In addition we have also toured to schools in Glasgow and Scotland, Cardiff, Swansea and Wales, Isle of man, Weston-super-Mare, North Somerset, Bath, Bristol, Bradford, Brighton, Cambridge, Cardiff, Chelmsford, Chester, Chichester, Coventry, Durham, Exeter, Gloucester, Hereford, Hull, Lancaster, Leeds, Lincoln, Newcastle, Norwich, Nottingham, Oxford, Portsmouth, Preston, St Albans, Salisbury, Sheffield, Southampton, Stoke, Sunderland, Rugby, Swansea, Wakefield, Wells, Westminster, Winchester, Wolverhampton, Worcester, Aldershot, Alfreton, Alton, Amersham, Amesbury, Andover, Ashburton, Axbridge, Banbury, Barking, Barnes, Barnet, Barnsley, Barnstaple, Basingstoke, Bedale, Bedworth, Berkampsted, Berwick, Bexhill, Bicester, Bideford, Bilston, Blackburn, Blapckpool, Bolton, Bodmin, Bournemouth, Bootle, Bradford, Brentford, Bridgwater, Bridport, Bromsgrove, Burnley, Bury, Buxton, Calne, Cannock, Chard, Castleford, Cheltenham, Chesham, Chippenham, Chorley, Clevedon, Corby, Cowes, Crawley, Dagenham, Dartford, Daventry, Deal, Dartford, Dartmouth, Didcot, Devizes, Diss, Dover, Dudley, Dunwich, Eastbourne, Ealing, East Grinstead, Eccles, Edgware, Edmonton, Ellesmere, Emsworth, Enfield, Epping, Erith, Evesham, Flamouth, Fareham, Farnham, Felixstowe, Ferryhill, Filton, Fleet, Flitwick, Folkstone, Frome, Gateshead, Gillingham, Glastonbury, Godalming, Goole, Gosport, Gravesend, Grays, Grimsby, Guilford, Hailsham, Halesowen, Halifax, Harlow, Harpendedn, Harrowgate, Harwich, Hastings, Hatfield, Havant, Haverhill, Hatfield, Hayes, Hemel, Hinckley, Hitchin, Holt, Hornsea, Honsey, Horwich, Horsham, Huddersfield, Hungerford, Hyde, Ilford, Ilminster, Ivybridge, Kendal, Kenilworth, Kidderminster, Knusford, Langport, Ledbury, Leek, Lewes, Leyton, Looe, Louth, Lowestoft, Lunlow, Luton, Lyme Regis, Lymington, Maccesfield, Maidenhead, Maidstone, Malm3esbury, Malvern, Mansfield, March, Marlow, Matlock, Melksham, Mere, Middlesbrough, Middleton, Middlewich, Morecambe, Morpeth, Much Wenlock, Nailsea, Neston, Newark, Newbury, Newcastle, Newhaven, Newmarket, Newport, Mormanton, Northampton, Northfleet, Nuneaton, Okehampton, Padstow, Paignton, Patchway, Peacehaven, Penrith, Penzance, Pershore, Petersfield, Plymouth, Poole, Pontefract, Prescot, Pudsey, Ramsey, Ramsgate, Reading, Redcar, Reigate, Richmond, Ripley, Rochdale, Romford, Romsey, Rotherham, Rugby, Royston, Ryde, St Austell, St Ives, St Helens, Sale, Sandy, Scunthorpe, Seaford, Seaton, Sevenoaks, Shrewsbury, Sidmouth, Skegness, Skipton, Slough, Snodland, Soham, Solihull, Somerton, Southam, Southborough, Southend, Southgate, Southsea, Staines, Stamford, Staveley, Stockton, Stone, Stroud, Strood, Surbiton, Sutton, Swanley, Swindon, Syston, Tadley, Tamworth, Taunton, Tewkesbury, Thame, Thirsk, Tipton, Tiverton, Torquay, Totnes, Tottenham, Tow Law, Uttoxeter, Uxbridge, Verwood, Wafebrisge, Wallingford, Walsall, Walthamstow, Ware, Warminster, Warrington, Warwick, Watford, Watton, Wellington, Wem, Wembley, Wendover, West Ham, Westerham, Weybridge, Whitby, Wincanton, Windsor, Winslow, Woburn, Woodbridge, Woodstock, Wooler, Worksop, Worthing, Yate, Yeovil, Basildon, Milton Keynes, Washington, Hertfordshire, Shropshire, Worcestershire, Buckinghamshire, Berkshire, Essex, Yorkshire, Gloucestershire, Somerset, Hampshire, Isle of Wight, Norfolk, Lincolnshire, Cumbria, Suffolk, Durham, Surrey, Bedfordshire, Oxfordshire, Dorset, Cornwall, Devon, Merseyside, West Midlands, Wiltshire, Warwickshire, Northamptonshire, London, Kent, Yorkshire, Leicestershire and many other places all over the UK. Return to Actionwork's shows page. 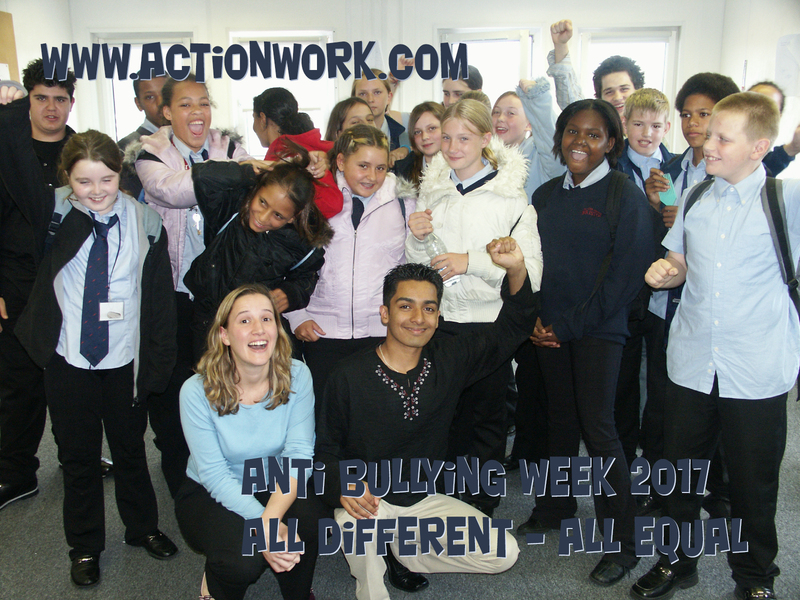 Go to Actionwork® anti-bullying workshops main page. Return to Actionwork's anti bullying pages.